Picklive, the online “real-time fantasy football” game aimed at football (AKA soccer) fans watching live games on TV, is making a bid to broaden its reach by launching a co-branded partnership with one of the UK’s best known football podcasts. The London-based startup has teamed up with The Football Ramble to launch a site where players are pitted against the podcast’s team during live matches each week. As we explained in our initial coverage, with Picklive users select three players from a football match being broadcast live on television. They are awarded points according to the relative performance of those players versus those selected by rival users. 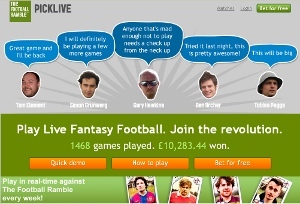 Meanwhile, Picklive recently launched a variation on its main game called ‘The Big Game’. Unlike standard games, which last seven and a half minutes, these games last the full length of a match, with participants selecting five players from the match instead of the usual three.